Brineddin Wood which overlooks Chapel Lawn is divided into parallel strips known as quillets. Apart from the fact that the wood’s incline makes access and working difficult, and despite some clear felling in the early 20th Century, it has probably remained fairly intact as a wood through having originally been part of a far larger former hunting chase for the Lordship of Clun. Researchers at St John’s College, Oxford have postulated that the wood may be an outlier of what was known as Porloke Chase in the middle ages. Purlogue, a nearby township, marks the southern edge of the Portloke Forest, for which there is a little information in the Inquisition Post Mortem in 1272. The forest was part of the lands of John FitzAlan (the FitzAlans, Earls of Arundel and later Norfolk), including the lordship of Clun. This lists a number of townships or hamlets ‘beneath Portloke’, including Lurkenhope, and Pentrehodry (so would include Brineddin Wood), and a further group which are said to be ‘above Portloke and in the hands of the prince with Portloke forest’. Skeat, a 19th century philologist, explains that the French term purlieu derives from Latin purus locus or land set free, which suggests that Purlogue does indeed refer to a forest purlieu (where commoners had land rights within a hunting forest) and Portloke’s location is right for a purlieu of Tempsett Chase, the larger forested area here whose name comes from the Teme-saetan people ‘of the Teme’ who occupied the whole of what came to be the south-west corner of Shropshire. Saete is a Saxon word for people or settlers and it is from this that we get Tempsiter, the name of the Lordship that straddled the English/Welsh border near Clun in the middle ages. Further resreach by St John’s College showed that the communities ‘beneath’ Portloke’ (roughly corresponding to the Redlake Valley) were said in 1272 to remain to be extended (i.e. to have an extent made of them) ‘because the tenants were unwilling to come before the escheator’ (assessor or surveyor). An extent is a survey of assets, particularly land values, so the tenants were reluctant for their holdings to be surveyed, presumably in case they ended up with having more to pay in rent, services, and/or customary payments. So much for down-trodden peasants! The earliest known reference to the wood is a legal indenture dating from 1728 relating to a wood called Gwellinharat (according to the English Place Name Society this probably means ‘Angharad’s bed’ – bed as in plot of land). Gwelinharat is the eastern portion of the wood, which is not divided nowadays and is under a single ownership, although maps from the 19th century show one strip of woodland remaining separate from the others. The earliest known reference to the wood is from a document reproduced here with permission of Shropshire Archives (ref 4066/2/17). It dates from 1728 but refers back to 1637 when the eastern portion of the wood was first sub-divided. Click to enlarge in a new window. Prior to 1637 the wood known as Gwellinharat was not divided into sections. In April of that year as the result of a ruling by the court of The Lordship of Tempsiter in the Hundred of Clun it was divided into 12 equal portions which were shared unequally between five local residents – three, three, three, two and one. 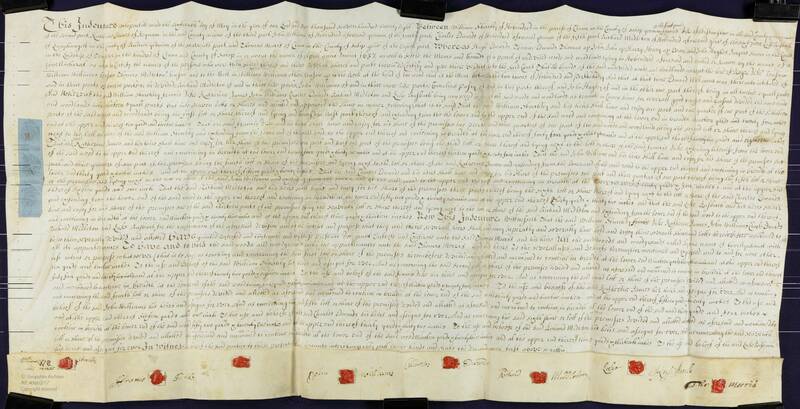 On 16th May 1728, the wood was divided again, this time into 13 lotts or shares which were then split into unequal portions between seven people, some of whom were descendants of the five beneficiaries in 1637. The seven residents held their ‘lotts or shares’ as tenants in common. The dimensions of the seven shares are described in detail. A local mathematician has failed to make sense of the method of divisions, so there’s a challenge for someone who’s familiar with rods, poles and perches. What we have not yet found out is when the main body of the wood was divided up, by whom, what conditions may have been imposed, and whether that was linked in any way to the divisions of Gwellinharat. More recently most of the houses belonging to freeholders in the village owned a quillet for the purposes of wood fuel, and building and fencing materials. Conversely, an apocryphal version of the wood’s history is that the freeholders could harvest fallen wood as fuel, but trees could not be felled, nor any wagon or other wheeled vehicle used to carry the wood away. Another version of the story say that the wood was somehow set aside for the benefit of the poor of the parish. It may even be that all of these are correct at different times in the past. In recent years research at Shropshire Archives has uncovered a few facts yet many questions remain unanswered.